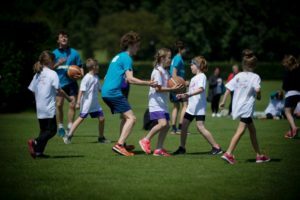 Over 140 school children from nine local schools took part in the Canterbury Minilympics sports day, to encourage active and healthy lifestyles. 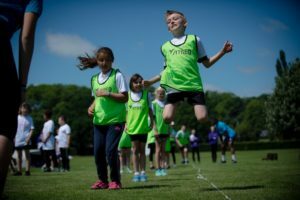 Pupils, aged eight and nine, and their teachers got involved in a day of team athletics and sports science tests at the Birley’s Field on Monday, 11 June, which was organised by the University in partnership with The King’s School. Triple Olympian Hockey Player Jen Wilson, gave the pupils motivational talks about the benefits of excelling in sport and activities included cricket skills run by Kent and England Women’s cricketer Hannah Jelfs and International cricketer Susie Rowe. Pupils participated in field testing and athletics which included throwing, jumping and running relays, which was organised by King’s School staff and students, Spires Academy ‘sports leader’ students and CCCU’s SportsLab team. The teams enjoyed a barbecue lunch and were also given a nutritional talk by Sports Nutritionist Christian Smith. Minilympics celebrates encouragement, teamwork and effort rather than sporting excellence, and the team captains nominated a “sporting star” from their team to win a trophy. 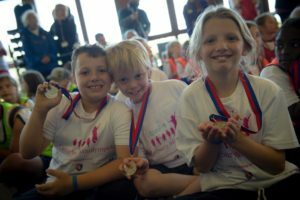 All the children went home happy, with a Minilympics T shirt and a medal to remind them of the day. We would like to express our thanks to the organisations who sponsored this event: Bidfood, Coombs, NCS Technology, Woodley Coles, Brighter Homes, Betteridge & Milsom and Sturts.